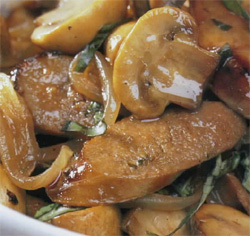 Mix together the basil and balsamic vinegar, garlic and onion and set aside. Cook the sausages on a medium heat until the skins are nicely browned, during cooking prick them with a fork to release the juices. Once browned, remove them from the p[an and slice diagonally into 1cm thick slices and set aside. In the same pan, stirfry the mushrooms for about 2 minutes, add back the sausages and pour over the basil mixture, add the stock, bring to the boil and simmer for about 5 minutes on a low heat, giving it a toss every few minutes. Serve with mash, rice or couscous. What can I use instead of balsamic viniger? ?